In the skyline of one of the most populated, urban areas of the world adjacent to one of the nation’s busiest airports, Elders Point Island in Jamaica Bay Gateway National Park, King’s County, N.Y., is the focus of an impressive marsh island restoration project. The first phase of construction is underway on a $13-million wetland restoration project. 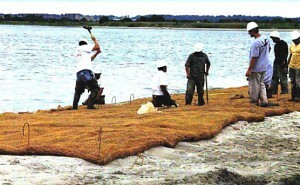 It is also the first full-scale project to address the marsh island recession issue in Jamaica Bay. 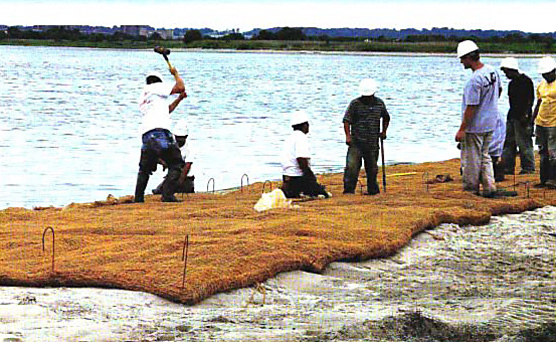 In March 2006, the corps awarded a $13-million contract for the Elders Point (East) Island Restoration in Jamaica Bay, N.Y., to Galvin Brothers of Great Neck, N.Y. To re-contour Elders Island, the corps is pumping more than 300,000 cubic yards of sand that was dredged from various channels in the harbor. Once tidal flow to the areas has been reestablished, water and sediment quality will be improved, promoting the return of native fish and wildlife. In total, approximately 70 acres of marsh will be restored on Elders Point with a net increase of 61 acres. Elders Point is comprised of two separate islands, Elders Point East and Elders Point West, that total approximately 21 vegetated acres. Originally one island comprised approximately 132 acres; the loss of marsh in the center portion severed the two ends, resulting in two separate islands connected by mudflat. The restoration plan for Elders East and Elders West includes restoring the existing vegetated areas and the sheltered and exposed mudflats by placing fill material up to an elevation that is suitable for low marsh growth. This includes hand-planting more than 700,000 plants on Elders East and replanting more than 200,000 plants on Elders West. Jamaica Bay is one of the largest areas of open space in New York City and contributes significantly to the overall health of the New York and New Jersey Harbor Estuary. The marsh islands ecosystem is an integral part of Jamaica Bay and is a refuge for a variety of wildlife. It also provides valuable habitat for fish species as well as a nursery for juvenile, migratory birds. The Marsh Islands ecosystem is an integral part of Jamaica Bay, which has been targeted for restoration by the U.S. Army Corps of Engineers and other New York and national agencies. Jamaica Bay is recognized by the United States Fish and Wildlife as a coastal habitat deserving preservation and restoration of habitats, which contribute to sustaining and expanding the region’s native living resources. These species breed and use the area as a nursery for juvenile, migratory birds that reside in the area during winter and migratory birds that stop-over in the area during fall and spring migrations. The overall program includes wetlands work in Staten Island and Jamaica Bay, N.Y., and Carteret and Woodbridge, N.J. Nearly 80 percent of the Hudson-Raritan Estuary’s (at 42,000 square miles it is one of the largest in the east coast) tidal salt marshes have been lost and even less of its 224,000 acres of freshwater wetlands remain. The NYSDEC estimates that approximately 1,400 acres of tidal salt marsh have been lost from the marsh islands alone since 1924, with the system-wide rate of loss rapidly increasing in recent years. Between 1994 and 1999, an estimated 220 acres of salt marsh were lost at an alarming rate of 44 acres per year (NPS, 2001). Further, it is estimated if this trend continues, all remaining salt marsh on the islands will be lost over the next three decades. The ongoing $27-million environmental mitigation program in the Hudson Raritan Estuary is being implemented in conjunction with the $1.6-billion New York and New Jersey Harbor Deepening Project. 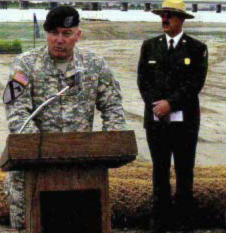 More than 1.5 million plants will be planted throughout the region.